This is the sixth installment of the memoir of Bryan G. Sherman, written in 1974-5 when he was 82 years old. Previous installments can be found down page and by following the March and April archives links found on the Museum Home page and elsewhere on this website. I’d now like to tell some of the changes in farm life that have taken place since my birth on February 27, 1892. A big change is in the way farm work is done now compared to my early years. 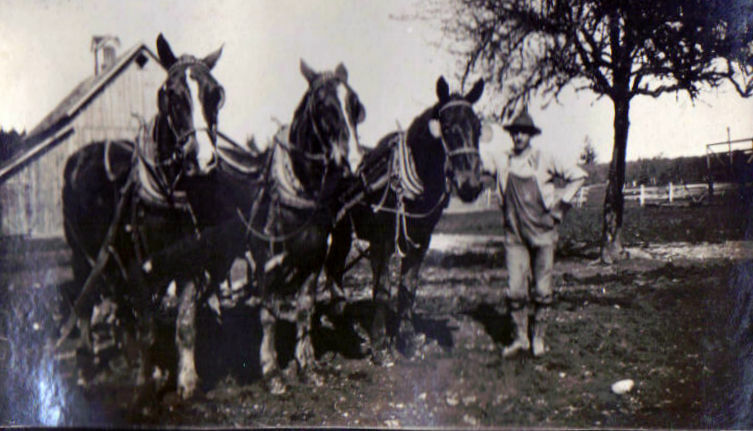 My first recollection of farming was with a team of horses hitched to a one-bottom plow. It took a long time to plow a field one furrow at a time. I think that was the main reason they did so much fall plowing in those days. Then in the spring the ground was ready to be worked down with a disc and drag to get it smooth enough to plant. Much of the new land in those days contained hazel brush roots which had to be loosened and pulled out before planting time. They used an A-shaped drag which was made of heavy beams of wood and large drag teeth which would loosen the roots so they could be picked up and burned. My 1st recollection of planting corn was the old 4-row marker, made like four sled runners, that was pulled along the soil, leaving grooves as planting guides. If one wanted to cultivate both ways, the field would be cross-marked and the corn would be planted, one hill at a time in each cross using a hand planter. Later on came the mechanical planters with the check-wire that planted the hills in a checkerboard pattern so it could be cultivated both along and across the rows. Later on and still in use today are the tractor driven planters that not only plant the corn but apply fertilizer and herbicide to kill the weeds so that one doesn’t have to cultivate much if any at all. Another phase of farming is the way harvesting wheat, oats, rye, and barley is done now compared to how it was done over 80 years ago. I have seen and participated in methods from the use of the old fashioned cradle (which was a large scythe blade mounted on a crooked handle with 4 wooden tines to catch and hold the grain until it could be laid in a windrow), later to be raked into and tied in bundles with a wispof the grain itself. The next method was the binder drawn by 3 or 4 horses that cut the stalks of grain which a moving canvases carried up through the machine where it was tied into bundles by the mechanism, then kicked out on the ground. 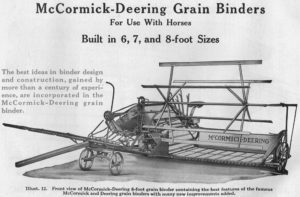 From the binder, we now have the combine, which either takes the grain from windrows or cuts the standing grain, and working like a threshing machine, separates the grain from the straw, and elevates it to a hopper at the top of the combine where it is later emptied into a wagon or truck. I have also seen this threshing done by the use of a device called a flail, a long pole with a short wooden attachment held on the end with leather thongs, used to beat the grains from the straw. In the early years before we had our own threshing machine, we always threshed our buckwheat that way or just used a pitchfork as the threshing tool. We generally did this in a wagon box or spread a canvas on the ground right out in the field to catch the grain. I also have had the job of harvesting when the bundles were placed in shocks in the field a few days to dry, then hauled and put in stacks (8 or 10 wagonloads to a stack) with 4 stacks in a set so the threshing machine could be positioned in between and 4 stacks could be worked on without tearing down and moving the machine to be setup again. Until Ernest was old enough to do it, this was generally done by a neighbor. Later on Elmer used to do some of the stacking. 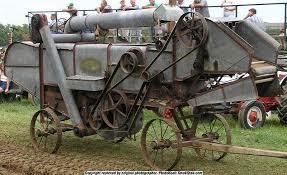 The first threshing machines I remember were hand fed. A man stood on a platform in front of the machine and guided the bundles of grain into the cylinders. (The cylinders are rotating parts of the machine that knock the grains from the straw—Ed.) The bands of twine holding the bundles had to be cut by a fellow standing on either side. These fellows had what were called band knives, generally homemade from sickle sections riveted into a piece of wood 8 or 10 inches long and fastened to the wrist with a leather string. These were kept sharp, and the one using them had to be very careful not to cut their hand. An improvement came with the self-feeder, a conveyer with a sprocket and chain system that stuck out in front of the cylinder. This carried the bundles through a set of rotating knives that cut the bands of twine before the bundle went into the cylinder. The person tossing the bundles onto the conveyer had to be careful so that they would go into the machines with the grain heads first, since the system did not work so well if the bundles went in backwards. The different power sources used for threshing that I have seen began with horse power, where teams of horses (I think generally four) were hitched to sweeps and straps used on their bits so they had to go in a circle, turning a carousel, and a tumbling rod ran from this power unit to the cylinder of the thresher. Then came the steam engine that had to be fired by hand with whatever the farmer had on hand. We generally saved the old used fence posts which had to be cut up by the man who ran the tank wagon providing water for the boiler. Then came the engine called an oil-pull which used gasoline to start and then switched to a heavy grade of fuel. Then came the farm tractor, so you see I have seen most modes of threshing grain. I even saw them thresh with a horse on a treadmill while over in France. It was a rather small machine and one man tied the straw in bundles for storage after the grain was threshed off. With corn it was quite different. In my early years and until middle age or past all corn was husked by hand and with all being done in cold weather, the fingers got mighty cold at times, especially if there was snow. One used a husking peg on right hand for right handed men and on left hand for left handed men. This was worn on the fingers and later there was the hook generally worn on the thumb side of the palm. Of course one had to wear gloves or mittens to keep hands warm. Now-a-days they go into the field with a machine that picks the ears and strips the corn from the cob in one operation, two and sometimes four rows at a time. If there is too much moisture in the shelled corn it is run through a dryer before it is put in storage to avoid mold. Some farmers and dairymen pick this high moisture corn and run it through a machine that makes it look almost like corn meal. This is stored in silos for feed to cows or feeder cattle. In the early years there were no soybeans raised for animal feed or for sale. For the last 25 or 30 years families have been raising soybeans, a rather high protein feed, and this is now getting to be one of the main farm crops. Another big change is the handling of the manure from the livestock on the farm. In my early days, and until I was out of school, all manure was hauled to the field on either a wagon or sled and spread by hand with a fork. Some days in the cold weather one got mighty cold standing out there spreading the manure. Sometimes in the winter when the snow was too deep in the fields, the manure was thrown out in a pile (which sometimes got very big before spring). I remember our first mechanical spreader. It was a Robinson, and the whole bottom of the spreader moved when unloading. It was made of slats of wood about 1×3 hinged together at the ends. This flexible bed ran on tracks on each side of box, and was propelled by a large chain sprocket on the rear wheel of the spreader. This furnished the power that ran the beater that scattered the manure as well as brought the load back to the beater. This was not too successful in the winter except on warm days. On those warm days we sometimes hauled all day. In real cold weather the carrier lag used to freeze. During my lifetime we had many kinds of spreaders but we kept that old spreader around for years even after we couldn’t use it for manure. We took out the lag bottoms and put in boards and used it for for hauling pumpkins and carrying feed for the pigs in early fall. It was around the farm for many years. We always had to clean the barn by hand, but now, most farms have a barn cleaner which elevates the manure into the spreader or a pile to be hauled later. Some large dairy farmers have a pit near their barn for liquid manure, which is then pumped into a tank wagon spreader (called a “Honey Wagon”) and then hauled to the field in liquid form. Our cows were always allowed to go to pasture both day and night except in winter. Most large dairy farmer’s cows nowadays never see a pasture, but are dry fed year around and are kept in the barn and exercise yard all the time. All our young stock, which consisted of dairy heifers and a bunch of steers raised as beef animals, were kept in the back pasture along the creek in later years, and the dairy cows were kept in the pasture nearer home. Always after a rainstorm we had to go down to fix the creek fence, which sometimes was quite a job. Many times we would hardly get home before going back and doing it over again. When Bear Creek got on a rampage, there generally wasn’t much fence left in the creek crossing. At these times if the cattle got there ahead of us, we would have to hunt them up, and sometimes we would spend a whole day hunting for some of the cattle after a storm. Sometimes we would find some that had been struck by lightening. As we always carried insurance we were reimbursed for those. Next week, the final installment of this series, discussing changes in household activities and life over his 80+ years.